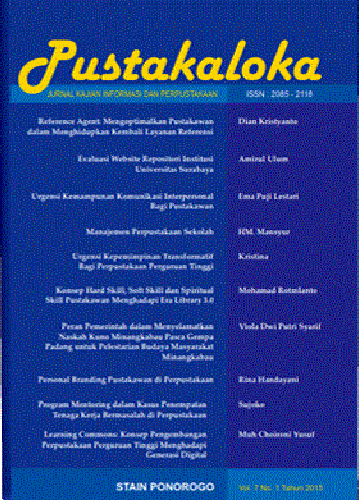 PUSTAKALOKA: Jurnal Kajian Informasi & Perpustakaan is a peer-reviewed journal taken from the library of IAIN Ponorogo on Information and Library Science. PUSTAKALOKA is published twice annually (June and Nopember) by the journal editors from the Library IAIN Ponorogo in cooperation with the Asosiasi Perpustakaan Perguruan Tinggi Islam (APPTIS) Jawa Timur. Every received article will be reviewed by the journal editors and external editors and reviewers who are competent in each related field. The review uses double-blind peer review before the journal is published. PUSTAKALOKA will publish selected paper under a Creative Commons Attribution ShareAlike 4.0 International License. And, every article is free of charge for authors and readers. Kami mengundang bapak ibu penulis untuk berkontribusi dengan mengirimkan artikel pada Vol 11 tahun 2019 Jurnal Pustakaloka IAIN Ponorogo. Adapun informasi selengkapnya di bawah ini atau ikuti link berikut.